← Celebrating the Legacy of Judith Ortiz Cofer + A Giveaway! Judith Ortiz Cofer was the first author to win the Pura Belpré Award for her first young adult book An Island Like You: Stories of the Barrio. On December 30, 2016, she passed away at the young age of 64, due to cancer. This week, we celebrate her life and work with reviews of four of her books and a giveaway. Please scroll to the end of this post to enter! DESCRIPTION OF THE BOOK: María is a girl caught between two worlds: Puerto Rico, where she was born, and New York, where she now lives in a basement apartment in the barrio. While her mother remains on the island, María lives with her father, the super of their building. As she struggles to lose her island accent, Mara does her best to find her place within the unfamiliar culture of the barrio. Finally, with the Spanglish of the barrio people ringing in her ears, she finds the poet within herself. In lush prose and spare, evocative poetry, Pura Belpré Award-winner Judith Ortiz Cofer weaves a powerful and emotionally satisfying novel, bursting with life and hope. MY TWO CENTS: Meet María Alegre and María Triste. She is María Alegre when as a young girl she makes her mother laugh by insisting they play Celia Cruz and dance mambo. María Triste emerges as it becomes clearer that Papi’s unrelenting depression means he will move back to New York City, his hometown. María’s mother, an English teacher and island girl, will not leave Puerto Rico, and María makes the decision to follow her father, with the plan of one day attending a good American university. As the cover states, this is a novel in letters, poems, and prose, and so María’s story unfolds through letters to and from Mamí, in poems María writes, and in short chapters about her friends, school, and life in a basement apartment in New York City, so different from the life she knew on the beaches of Puerto Rico. The vignette structure could draw comparisons to The House on Mango Street, and also like that book, this offers a portrait of a neighborhood that is burgeoning with life but also tinged by sadness. María’s resilience is impressive. Despite her loneliness and strange new surroundings, she cooks and cleans for Papí and helps him manage the tenants’ concerns. The assembly of characters is vivid. There’s her wild best friend Whoopee Dominguez, or Whoopee the Magnificent, the sweet-talking Papi-lindo who lives on the fifth floor, Uma and her single mother from India who want Puerto Rican husbands and are practicing their salsa steps, and Mr. Golden, María’s English teacher who recognizes her gift with poetry. Papí, El Súper in a blue uniform, takes up guitar and plays old Puerto Rican songs for his tenants, eliciting a nostalgia for an island that many of them have never even seen. The question of whether he and Mamí will reunite does hang in the air for awhile. But we know that María will be strong enough to carry on and even flourish if that never happens. She is a keen observer of the world and people around her, and it’s a joy to see how her lessons at school ignite her imagination. Heartbreaking, whimsical, and inventive, this is a beautiful novel which succeeds on many grounds. It’s funny and fast-moving, but boasts true emotional depth. Call Me María is just one example of Judith Ortiz Cofer’s amazing ability to capture the life of young Puerto Ricans in the barrio. 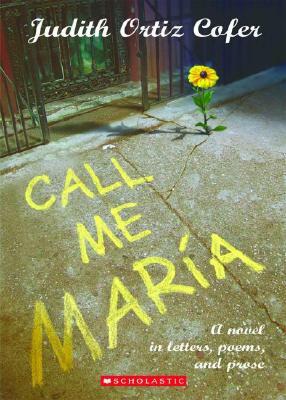 WHERE TO GET IT: To find Call Me María, check your local public library, your local bookstore, or IndieBound. Also, check out Goodreads, Amazon, and Barnes and Noble. ABOUT THE AUTHOR: Judith Ortiz Cofer is an award-winning author known for her stories about coming-of-age experiences in the barrio and her writings about the cultural conflicts of immigrants. She is the author of many distinguished titles for young adults such as An Island Like You, Silent Dancing: A Partial Remembrance of a Puerto Rican Childhood, and The Line in the Sun. She was the Regents’ and Franklin Professor of English and Creative Writing at the University of Georgia. In 2010, she was inducted into the Georgia Writers Hall of Fame. ABOUT THE REVIEWER: Toni Margarita Plummer is a Macondo Fellow, a winner of the Miguel Mármol Prize, and the author of the story collection The Bolero of Andi Rowe. She hails from South El Monte, a working-class suburb of Los Angeles, and worked as an acquiring editor for more than ten years at a major publisher. Toni now freelance edits and lives in the Hudson Valley with her family. Visit her website at ToniMargaritaPlummer.Wordpress.com.